Latif Nadia is doctoral candidate in the Department of Anthropology at Columbia University. Her dissertation examines the relationship between kinship, belonging to place and the articulation of national identity in the context of a Palestinian refugee camp in Lebanon. What then constitutes a Palestinian refugee camp in Lebanon as a refugee camp ? How have the Palestinian refugees inhabited and experienced these spaces over the years ? 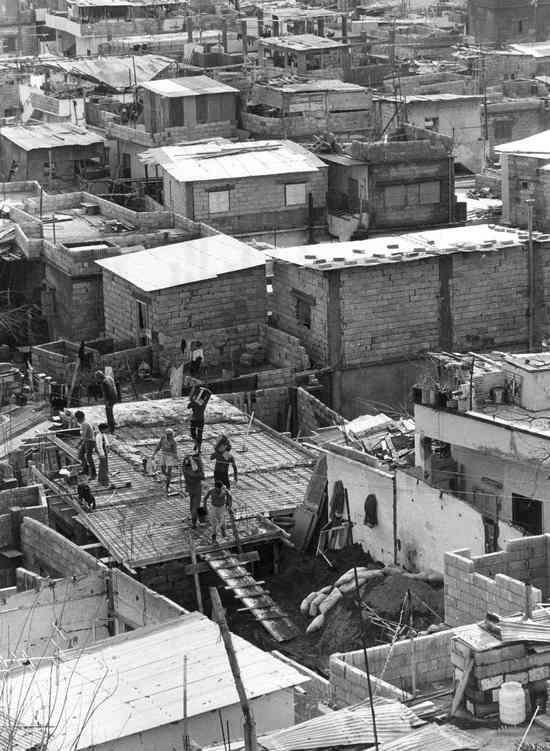 This essay examines these questions in the context of Bourj el-Barajneh refugee camp located in the southern suburbs of Beirut. It draws on material collected through participant observation and unstructured interviews during two years of fieldwork (2003-2004, and 2005-2006), as well as research at the archives of the International Federation of Red Cross and Red Crescent Societies (IFRC) in Geneva (February 2007). Within social science scholarship, refugee camps are often perceived as sites of incarceration, or as transient spaces providing temporary shelter until their occupants’ return ‘home’, or assimilation into the new ‘home’ provided by a host country (Diken and Laustsen 2005, Perera 2002). 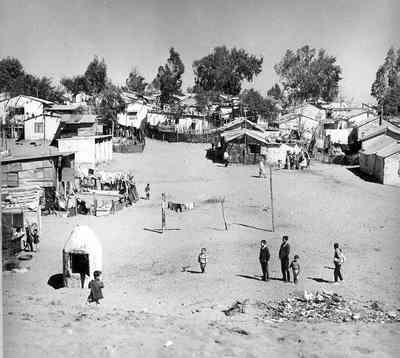 However, the Palestinian refugee camps in Lebanon are among the world’s longest existing refugee camps. Some were originally established at the beginning of the twentieth century to accommodate the survivors of the Armenian massacres in Turkey. Others such as Bourj el-Barajneh were set up in 1948 to accommodate peasant and low-income, urban Palestinian refugees who lacked the means to support themselves. In either case, the Palestinian refugee camps in Lebanon have now been in existence for almost sixty years and are inhabited by four generations of refugees of whom all but the first know Palestine only from textbooks, the memories of their elders and more recently the globalised media. To a visitor, these camps present the appearance of typical low income settlements—cinderblock housing, overcrowding, unplanned construction, and irregular provision of basic services. In fact recent studies on urbanisation and urban development in Lebanon have categorised them as slums (Fawaz and Peillen 2003). If the manner and type of settlement does not constitute the camps as camps, neither does their demographic makeup per se. Almost every camp has a non-Palestinian population comprised mostly, but not entirely, of Lebanese and Syrian nationals who choose to live there because of low cost of living. Additionally, not all Palestinian refugee residential conglomerations are camps. What then constitutes a Palestinian refugee camp in Lebanon as a refugee camp ? How have the Palestinian refugees inhabited and experienced these spaces over the years ? This essay examines these questions in the context of Bourj el-Barajneh refugee camp located in the southern suburbs of Beirut. It draws on material collected through participant observation and unstructured interviews during two years of fieldwork (2003-2004, and 2005-2006), as well as research at the archives of the International Federation of Red Cross and Red Crescent Societies (IFRC) in Geneva (February 2007). Hyndman describes the way the refugee shelters in the camps she worked in were ordered along neat grids. Aerial photographs were used to count them in order to estimate the size of the population. The hierarchy of power relations was mapped onto the spatial organization of the camp in the form of distinct and segregated living spaces for the refugees and the humanitarian organisations’ personnel. The boundaries of the latter were conspicuously marked by two security fences and the deployment of armed guards at night. They also provided their residents with a much higher standard of living conditions in the form of permanent, weather-proof structures, considerably larger person to space ratio, electricity, running water and indoor toilets. In addition, the location of the organisations’ offices, food rations, medical services provision, and police protection was based on ensuring the security of the organisations’ personnel, rather than convenient access for the refugees (Hyndman 2000). None of the Palestinian refugee camps in Lebanon correspond this spatial order. This is not to say that the camps are not disciplinary spaces in the Foucauldian sense or that power does not mark their spatial and social organisation. On the contrary, the shifts in Bourj el-Barajneh camp’s boundaries and the difference in their permeability over time demonstrate the ways in which power relations are spatially embedded. 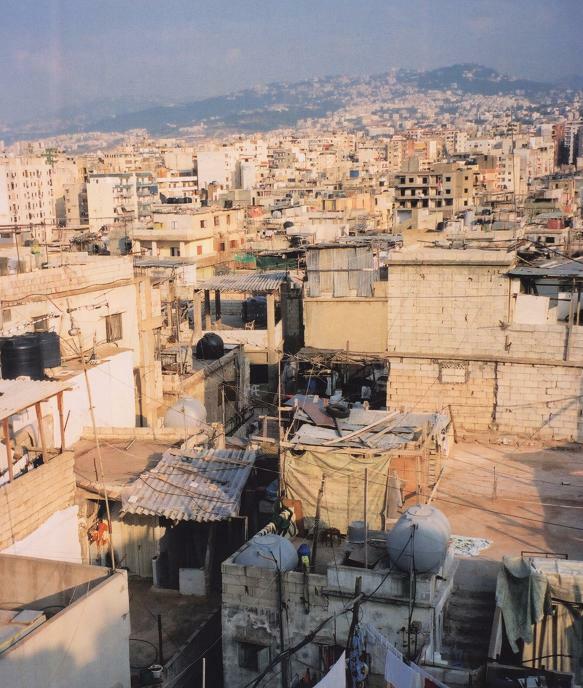 Though Bourj el-Barajneh’s site was not selected for the refugees by the Lebanese state or a humanitarian organisation, its location was fairly isolated as is the case with many refugee camps around the world. However, in this case the social economics of ‘charity’ rather than a humanitarian organisation or state’s decision were the determining force. The land allocated to the refugees who settled the camp was located in an undeveloped, sparsely inhabited, agricultural area south of Beirut. Most of the first generation Palestinian refugee inhabitants of Bourj el-Barajneh I interviewed did not know how the camp was established. The usual response to my query was that it had already been there when they arrived. UNRWA promotional material merely states that the camp was set up in 1948 by the LRCS . Research at the IFRC archives in Geneva confirmed that the camp came into existence in 1949  but did not yield any further information. An article by a French researcher claims that a prominent family. the Aghas, from a village in the Galilee called Tarshiha, secured land from the mukhtar of Bourj el-Barajneh village to accommodate less affluent families of their village with whom they had patron-client relations (Gorokhoff 1984). According to this version the Aghas were vacationing in Lebanon when Tarshiha fell to the Haganeh in October 1948 ; so they went to stay with friends in Bourj el-Barajneh, at this time a small village on the southern outskirts of Beirut. Many families from Tarshiha had fled to the southern city of Tyre, and the Lebanese government was planning to transfer them to Aleppo in northern Syria. However, when they heard that the Aghas were already in Beirut, many refused to leave and went up to Bourj el-Barajneh to join them. The Aghas then secured land from the mukhtar for their use in an area south of the current location of the camp, known as Ein el-Sikke. As more and more families from Tarshiha and its neighbouring villages came to join those in Ein el-Sikkeh, more land was needed. A local notable, Haj Rachid, agreed to exchange it with 0.1 sq. km. of his own land for the Palestinians to use as long as they needed it. An interview with a member of another prominent Tarshiha family, the Mustafas, provided a slightly different account. He claimed that his uncle was responsible for securing the land that came to be the camp. His uncle had been an influential person in Tarshiha and had made use of his economic ties with a prominent family from Bourj el-Barajneh to obtain land for the refugees from his village to stay on until they could return. Soon after, when the owner of the land attempted to displace the refugees from his property, they were able to enlist the support of a sympathetic Lebanese general. Some time we had to throw away the dough because the sand got into it, because it would fly around whenever there was a breeze. When we had to fill water it was very hard to walk because the sand was so hot. It would burn our feet. If you had to walk uphill it was really difficult because the sand would sink down. There weren’t any people living here...also there wasn’t an airport, so when they built the airport the area became important. But before it was deserted…There were pine groves and thieves used to hide in them. That where they put us. It was very difficult to live here with the hot sand and the sun. We used to go to the tile factory to bring tiles to put on the sand so we could walk on it…People worked hard in those days. It’s not like that now. Life is easy now. de Beyrouth, Bourj el-barajneh," in Politiques urbaines dans le monde arabe, pp. 313-330. Lyon : Maison de l’Orient Méditerranéen. —. 1996. "National Geographic : The Rooting of Peoples and the Territorialization of National Identity Among Scholars and Refugees," in Becoming National. Edited by G. Eley and R. G. Suny, pp. 434-453. Oxford : Oxford University Press. Arabic for “foreigner” ; more often used for a Westerner than for someone from a non-Western country.